Looking back, it’s perhaps no surprise that I’ve gravitated to the Tulsa Area United Way. The big threads in my vita (University of Tulsa, Centralia College, University of Washington, and working with nonprofits, foundations and museums via Mindful Technologies) are service to community, and higher education. I thought I’d take some parts of my slide deck for this post in case others might want to know how they can give back through their tech skills. 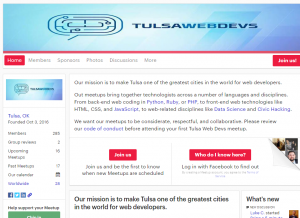 TulsaWebDevs is the granddaddy of them all. They have approx. 285 registered members. They’re the folks (along with Code for Tulsa) who popularized “Civic Hacking” around here when they put Tulsa Transit bus routes in Google Maps. 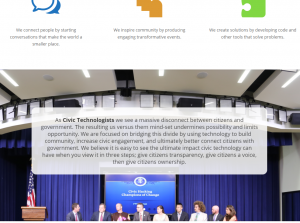 Civic Ninjas , founded by Scott Phillips. They’ve done work on apps and approaches for first responders (better dispatch of Fire resources, Urban Search & Rescue via mapping when landmarks/street signs are nonexistent, and the Citizen Power Brigade: providing emergency power to electronic devices). They also are working on HealthAroundMe: an app that educates you on health scores and resources in your area. 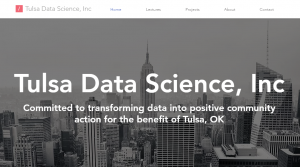 Tulsa Data Science, Inc. Founded by Ben Harris. They’re focus areas at present are examining the data behind Tulsa’s fire codes, and looking at city trends in Per-Capita Income and how to raise it. Techlahoma . In addition to being a prime source of links to lots of user groups (Tulsa, OKC, Muskogee, Big Data, Coding, WebDev, Linux, etc. etc. ), they host a couple of conferences each year: “200 OK” (web development, was on 6/2/17 in Tulsa), and “Thunder Plains” coming up on 11/3/17 in OKC. Two of the prime movers are Jessie and Amanda Harlin. Amanda helped birth the Nerdy Girls Code Club in OKC. Now there’s a branch in Tulsa, and more spreading around the country. Code for Tulsa. A local affiliate of Code for America, they hold regular monthly meetups at 36 Degrees North and a monthly hack night. About 250 registered members. The Mine does community-based, high-impact projects, mostly in the social entrepreneurship space. Working in teams of 5 peers each, with $10K in seed funding once approved. Not purely volunteer: you apply, pay a yearly tuition of $975, with a project commitment of 25+ hours per month. 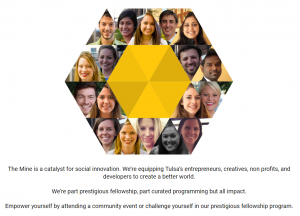 Our own TAUW alumnus Hannah Ralston runs it these days, and many of their Mine fellows go on to do cool things with other nonprofits as well. Hannah has “office hours” at…say it with me…36 Degrees North every Thursday. Self-described as “open mike night for geeks,” Ignite Tulsa offers an evening of networking, education and entertainment with lightning-fast presentations on a variety of topics. Their tagline is: “Enlighten us, but make it quick!” You get 5 minutes on stage, less than 20 slides, and whatever topic you feel passionate about that you want to educate others on. 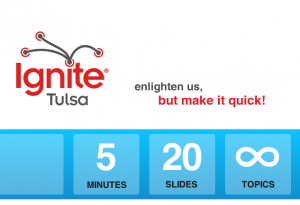 Ignite Tulsa just had their latest session last week, and this was their first in almost 2 years. For a shameless bit of self-promotion, our own NTech Collaborative. NTech was born 16 years ago out of frustration of learning that IT consulting firms in town would charge their nonprofit clients full price for services. 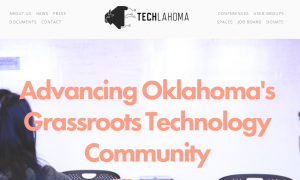 Focused exclusively on the 58 partner nonprofits of the Tulsa Area United Way, NTech Collaborative has spearheaded innovative approaches like Virtual Desktop Infrastructure (VDI) for small nonprofits (currently 12 nonprofits), and hosting 22 WordPress sites. All for free — by providing a one-size-fits-all approach with VDI, NTech can provide support to 12 nonprofits, and the 22 web sites — with only 2 FTE. Let me say that again: ONLY 2 FTE: John Cory and Seth Bevan. 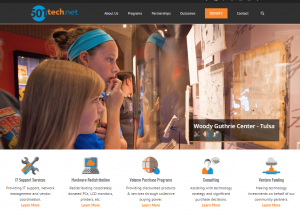 501TechNet is like NTech, only (a) uses a fee-for-service model and (b) works statewide. Some of our partner nonprofits utilize them as well as us. They accept hardware donations, and reload/refurbish PCs. 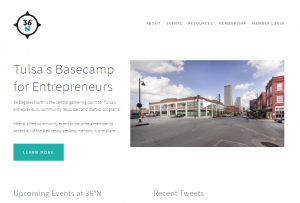 They were born out of the Tulsa Community Foundation back in 2010, and are a 501c3 nonprofit themselves. They have 9 FTE and a cadre of volunteers and a list of trusted vendors. While not everyone wants to do tech for their day gig and then go do it in their volunteer activities, there are lots of nonprofits staffed with people who care deeply about their mission who NEED you. Whatever that mission is, that’s their primary thing. Feeding and housing the homeless is much more of a charge than working with a database of the homeless, but both are equally important.